Presto is one of the most popular brands in kitchenware, and the electric cookers are the latest revolution in this century old cooking technique. It is just natural that the combination of the two delivers one of the ultimate kitchen appliances that are efficient and comfortable to use. Presto 02160 is one of the highly rated models in this category. 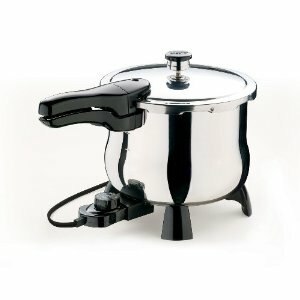 This electric pressure cooker from Presto has a six quart capacity which is ideal for any standard home or a family of four. The best part about this size is that it is ideal to cook meals for the whole family and at the same time, it does not occupy a lot of counter space. The next good thing about this model is that it is a stainless steel cooker. There are two benefits of this: first of all, the stainless steel gives a kind of finish to the cooker which makes it look new for a long time. Secondly, the stainless steel vessels can be cleaned easily and quickly than the aluminum one. Also, since this is dishwasher safe you need not hand wash it every time. You can put it in the regular dishwasher load and get it cleaned. The aluminum base is another important aspect about this cooker. This base ensures quick transfer of heat from the source to the food inside which is vital for quick cooking. Besides, it also ensures a uniform distribution of heat overall, so your food gets cooked completely from all the directions. Of course, with electric circuitry, there are some smart controls on the cooker too. The cooker has a Control Master that regulates the heat to match the pressure and temperature within the cooker as the food is being cooked. This is important from the safety perspective as you know the cooker will not implode or explode due to high or low pressure inside. Besides, the control master also ensures perfect cooking of food if pre-sets are used. The stainless steel steam basket is a great accessory to have when you want to cook more than one item at a time. This can really help reduce the cooking time and make the cooker more useful. The basket ensures that multiple foods do not mix with each other and that you can retain the taste of each dish separate. On the safety side there is the cover locking system which ensures that the lid will not open till the pressure within the cooker comes down to regular levels. 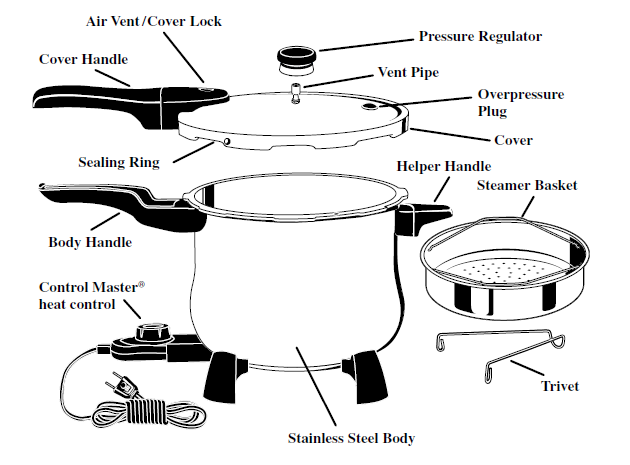 Finally, for all the first time or new pressure cooker users, Presto has a comprehensive user manual that gives you information on all the mechanisms of the cooker so you need not have to struggle trying to figure a way out. Besides the recipes in the book are a great way to get you started with pressure cooking on Presto electric pressure cookers. Pros: easy to use even for first time user, last for several years, easy and quick to clean, absolutely zero problems. Cons: The valve can get stuck on the gap between pot and the handle. But you can always return it and change with a new one. Presto has a great customer service so let this not worry you. Mostly their rating is 4.6 out of 5 stars. and 95% of them recommend this product.